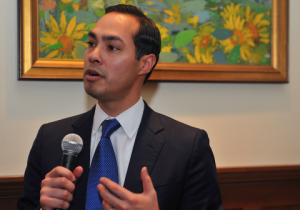 Former Housing and Urban Development Secretary Julian Castro, a potential contender for the 2020 Democratic presidential nomination, issued a "challenge" to every candidate likewise weighing a White House bid to refuse any and all campaign donations from political action committees. Castro delivered the challenge during a visit to Iowa on Monday, ahead of the expected launch of his presidential campaign later this week in his hometown of San Antonio, Texas. "I'm not from Washington, and I believe that we need to change the culture of Washington to one that works for people out there trying to make a living," Castro told a private gathering in the first state to hold caucuses. "I'm not going to take any PAC money if I run in this campaign, because I believe that we should work for the people, not for the special interests in Washington, D.C."
"I would challenge every candidate, if they get into this race, to do the same," Castro added. Castro, who served in the Obama administration from 2014 and 2017, was on Hillary Clinton's short list of potential running mates in 2016, before ultimately losing out to Democratic Sen. Tim Kaine (Va.). After leaving the administration, Castro's profile has grown within the Democratic Party. In 2017, he formed a new PAC and traveled across the country fundraising and campaigning for Democratic candidates up and down the ballot. After the 2018 midterms, Castro announced the formation of a presidential exploratory committee. At the time, the former secretary pledged that, if he were to enter the race, his campaign would not accept money from PACs. Castro also "discouraged" the creation of a super PAC to underwrite his candidacy. It is unclear whether this pledge will apply to contributions collected using PAC resources. In the past, several high profile candidates have utilized this loophole to accept bundled donations. The Des Moines Register reported that Castro, who only announced his visit to Iowa over the weekend, drew a crowd of more than 75 attendees.